touches of sense...: A ramblers guide? The sight across the valley was breath-taking. We felt simultaneously insignificant and unique; witnesses to wonder! How twee! A point of view is a lie. We may be standing on a point but we are immersed in a wealth of sensory information crying out for attention. Fix a point; all dies. God, I love a semi-colon. We are crying out for attention. We are in a privileged position. LOOK. LISTEN. BREATHE IN. FEEL. HERE. THERE. UP. HERE. We are moved to poetry, to lyricism. We are one with Wordsworth (or maybe not). We are alone and yet universal (or certainly not). What sense is there in analysing beauty? Is it not enough to share it silently? What has science got to do with humming to oneself? What is the sense of speaking with fells? And yet. And yet we do. We need points on maps. We annotate, we paragraph nature. We take our photos and disappoint. No a photo will not do at all. No a photo is a lie. We must be more generous with our readers. Writing moves and then dies. What is the sense of reification of rhizome? #Rhizo14 is not dead anymore than it was alive. It is a nonsense waiting for traces of humanity. Might we write sincerely of rhizome and encourage others to get lost in its complexity. Might we invite to ramble. A guide might offer the rambler clues of things to look out for. A guide might offer some stories. A guide might offer some line drawing. A rambling guide offers nothing for a person who is only interested in going from point A - B in the fastest possible way. That is not its point. You are better off with Sat Nav. 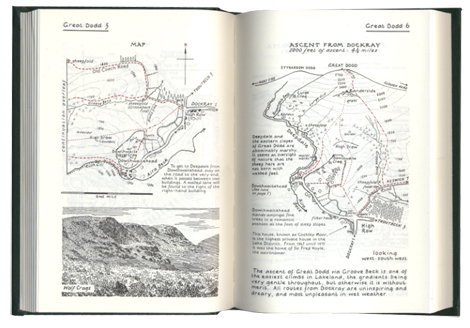 In the introduction to a ramblers' guide there are clear explanations as to its role, as to how it may or may not be used, as to its limitations. It invites others to annotate, to draw, to colour in details, to dream about future adventure. It may offer a few reputable addresses. It is soon out of date. It's only purpose is to invite to venture into the wilds be it only in a person's dreams. The Rambler Samuel Johnson #88 "Hodie Quid Egisti"
The Idler Hugh Warwick "THE TALE OF THE GRAPE-GATHERING HEDGEHOG"
We descend into myth and legend...Jabberwock. Reality at last. Simon, this a beautiful resonance of the rhizome, an echo beautiful in its own right/write. I will keep this.